It's obvious that we eat effects our health, but did you know what goes ON your skin, goes IN your body too? We're talking lotions, deodorants, make-up, detergents, as well as environmental substances that we touch and breathe, like cleaning products. So, the more natural, the less synthesized, the better. This is a continual work in progress for me personally, but is something I am becoming more and more aware of as I seek out new products. I continue to make more and more changes as time goes on and I learn more. This is especially important as I continue my journey to creating an optimal state for baby! Little changes, layered in over time will make a BIG impact! Below are some of my family's favorite products and recommendations. I have linked each product, and contacts for some as well!! We started using this soap when we started washing our own cloth diapers. Turns out is pretty awesome stuff, so we continue to buy it in bulk. Go Charlie's! These were another thing that changed in our laundry routine when be began washing cloth diapers, and something that we continue to use! A few drops of essential oil on them make any load of laundry smell fab! CONFESSION: When I started my business, cleaning was the first thing that I outsourced! Aside from basic surface cleaning/straitening and running the vacuum, I don't do much. We keep a spray bottle of vinegar and water in bathrooms, and the kitchen to spray/wipe down surfaces, and it works like a charm! Mix 3 parts vinegar, 1 part water. Baking soda is an odor neutralizer and deodorizer. We store ours in the fridge to keep things smelling so fresh and so clean clean. It is great to freshen a load of funky laundry, pet odors, and as an exfoliate for tile, grout, sinks and tubs. Add 1/4 c to the recipe above for these added benefits! I love this is a carrier oil with my essential oils! For a night time face moisturizer, I use Apricot oil + Frankincense + Melaleuca, and it makes my skin feel amaze. Amazing full body lotion. I've used this for Ziggy since he was a babe as well! Local to Pittsburgh, PA, and specializing in providing natural, safe and environmentally-friendly body care products that support outdoor recreation throughout the seasons. A MUST try! Tom's remains a reputable all natural brand--we love their toothpaste, for kids AND adults! It took me a while to get on the natural deodorant train, yall! And I'm going to be honest, I now wonder what took me so long to get on. Native is online only, works better than any traditional deodorant I've ever used, and smells amaze. Get some. Use this link for a free travel size with your first order! I have a jar in my kitchen, and a jar in my bathroom! For body, use it as a moisturizer, on a pregnant belly, on baby's skin, as a carrier oil for essential oils and salves...use orally to pull toxins, or as a hair mask, too. A must have staple to any home. I've only been using essential oils for about 15 months, but am falling more and more in love! There is SO much to learn, and my guru, Stephanie of East End Oils, is always there to support me and guide me on my essential oil journey. If you are not currently working with a guru, click the link above to get in in touch with her! 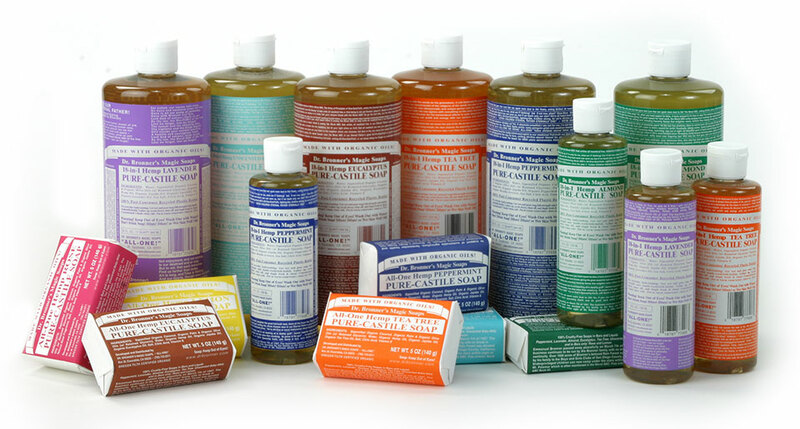 Chris tried to get me on the Dr Bronner's train when we first met, and I told him I didn't want to smell like a hippy. LOL! This soap is a-maze, all purpose in the shower, perfect for cleaning or laundering just about anything. Treat yourself to a bottle, and learn about all of the ways to use this amazing soap right on the label. Sooooo, I can't speak for the surface cloths because I don't do much cleaning, BUT I LOVEEEEE the body cloth!! I use it daily to wash my face--perfect for in or out of shower, and travels well! If you're not working with a Norwex guru, and want to learn more, contact my friend and guru Brie by clicking the link above! A sister owned company, committed to creating products that clean effectively while maintaining a balanced eco-system while supporting your overall health. Shop home & body! I also had soooooo many other great recommendations shared on social media! I ran them all by the Environmental Working Group (EWG) Skin Deep App to see how they ranked, am including some more recommendations based on what I learned below! Learn more about the EWG HERE! Have a favorite product that's not listed here? See how it rates on EWG, and SHARE here! I'd love to hear from you! Contact me HERE.